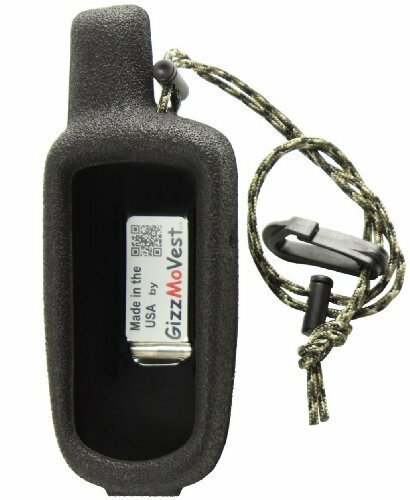 GizzMoVest Compatible with Garmin 64 GPSMAP 64s, 64 CASE COVER in 'Special Ops Black'. High-tech Composite Molded Protection includes Metal Belt Clip, Wrist Lanyard-Clip. MADE IN THE USA by GizzMoVest LLC at iShare Maps. MPN: Garmin GPSMAP 64 Case, Black. Hurry! Limited time offer. Offer valid only while supplies last. Garmin GpsMap 64s amd 64 CASE MADE IN THE USA by GizzMoVest LLC provides the ease-of-use of a holster but the protection remains intact while in-use. Garmin GpsMap 64s amd 64 CASE MADE IN THE USA by GizzMoVest LLC provides the ease-of-use of a holster but the protection remains intact while in-use. An extremely rugged, all custom-molded case, provides an easily-gripped textured rubber surface for all kinds of weather. (impervious to water) The outer surface sheds dirt easily, yet it is almost a magnet for fingers!Battery Access: Just Loosen the Lanyard Lock to remove the GPS in 3 seconds! This clamshell case hinges at the bottom. This 'Living hinge' contains a layer of Polyethylene, to withstand 10s of thousands of openings and very rough use. Backed by the manufacturer's 3-Yr. Warranty against defects and workmanship. Use 'In-The-Case': Easy access to all buttons.The buttons and screen become deeply recessed to protect them and avoid unwanted waypoints or accidental input. This Protective Case adds just 3 oz to your Garmin 64. However this case DOES NOT float. The Wrist Lanyard with safety clip enables the device to be held securely. Includes a removable Metal Belt Clip. NOTE: Case Does NOT fit the GPSMAP 60. Search Amazon to see all models and colors. NOTE: IN-STOCK. Recieve it in 2~4 days most anywhere in the continental US by 1st Class Mail ! Garmin GPSMAP 64s, 64 COVER MADE IN THE USA by GizzMoVest LLC in a firm Textured-Rubber-Skin provides a tactile hand grip. Snugly fits Garmin 64 & 64s series units See other version for Camera-equipped models. Fully washable (cool air dry). GPSMAP 64 Screen becomes deeply recessed for maximum protection in use. Removable Metal Belt Clip, Adjustable Wrist Lanyard and Safety Clip. Use 'in-the-case' - Access to ALL butons. Access to Battery Door in 3 seconds! A nearly indestructable Case, yet lightweight - 2.8 oz.